"March Madness" was born in Illinois. The annual tournament of high school boys basketball teams, sponsored by the Illinois High School Association, grew from a small invitational affair in 1908 to a statewide institution with over 900 schools competing by the late 1930's. A field of teams known as the "Sweet Sixteen" routinely drew sellout crowds to the University of Illinois' Huff Gymnasium. In a time before television, before the college game became popular with the average fan, before professional leagues had established a foothold in the nation's large cities, basketball fever had already reached epidemic proportions in the Land of Lincoln. Henry V. Porter, assistant executive secretary of the Illinois High School Association, was so impressed by the phenomenon that he wrote an essay to commemorate it. Entitled "March Madness," it first appeared in the Illinois Interscholastic, the IHSA's magazine, in 1939. The term struck a chord with newspapermen, who used it throughout their pages. During the tournament's "Golden Era" of the 1940's and 1950's, "March Madness" became the popular name of the event.It was an era of some of Illinois' most legendary teams, including the undefeated 1944 Taylorville squad and Mt. 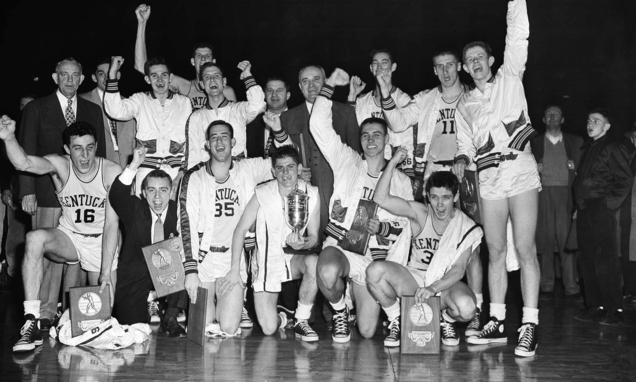 Vernon's unstoppable back-to-back champions of 1949 and 1950. But the one champion remembered more than any other is tiny Hebron, a school of only 98 students, which won the tournament in 1952. The IHSA tournaments continued to grow and develop. In 1963, the tournament moved to the huge new Assembly Hall on the campus of the University of Illinois and fans witnessed the most famous finish in history, when Chicago Carver beat Centralia on a last-second shot by a substitute named Anthony Smedley. March Madness" grew as well. Beginning in 1973, the IHSA began using the term officially in its programs and on its merchandise. In 1977, the organization enlisted veteran Chicago sportswriter and Big Ten basketball referee Jim Enright to write the official history of the boys basketball tournament. The result was March Madness: The Story of High School Basketball in Illinois. As media technology advanced, the IHSA and KOST Broadcast Sales of Chicago produced March Madness: The Official Video History of the IHSA Basketball Tournament in 1989. Both the book and video were sold nationwide. During this period, the Illinois High School Association received trademark status for the term "March Madness" and registered the trademark "America's Original March Madness. "The spirit of March Madness has subsequently spread from coast to coast, as other companies and organizations, including state high school associations and manufacturers, have been licensed by the IHSA to use these trademarks. Today's March Madness is different from the original version. Nowadays an "Elite Eight" of teams advances to the state finals, but there are four tournaments — a Class A (small school) and Class AA (large school) version for both boys and girls, played in Peoria and Normal. The Happening," a thrilling contest featuring the state's best three-point shooters and dunkers, is now a part of these tournaments as well. And starting in 1996, the "March Madness Experience," an exhibition hall full of fun, games, and good times, has allowed fans of Illinois high school basketball to join in the action. The popularity of these events now allows the IHSA to provide more than just good entertainment for its fans. A significant portion of the fees generated from the licensing of the unified marks "March Madness" and "America's Original March Madness" are used to fund college scholarships for Illinois high school boys and girls.